Osaka Shochikuza is a theater in the Dotonbori district of Osaka which often holds performances of classical Kabuki drama. This Neo-Renaissance theater first opened in 1923 and was modelled after the Teatro alla Scala in Milan, Italy. Originally, it was used primarily as a movie theater but also hosted musical performance reviews. The last movie shown here was the classic “Gone with the Wind” in 1994. After that the building underwent extensive renovations until reopening with all new facilities in 1997. While the original exterior facade has been preserved, the theatrical facilities inside are now entirely modern. The theater now has seats for 1,033 people on three levels with excellent acoustics and state-of-the-art devices such as a revolving stage and trap doors. 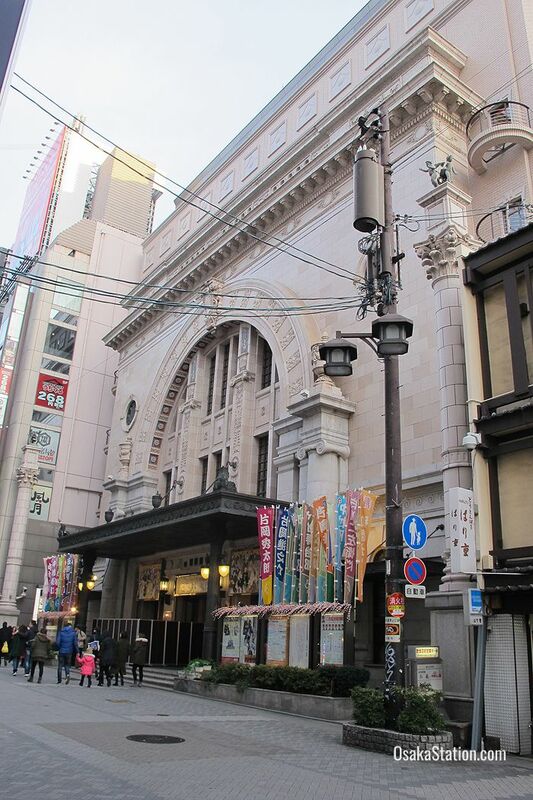 In addition to Kabuki this theater also holds performances of new contemporary dramas, musicals, comedies, and opera. 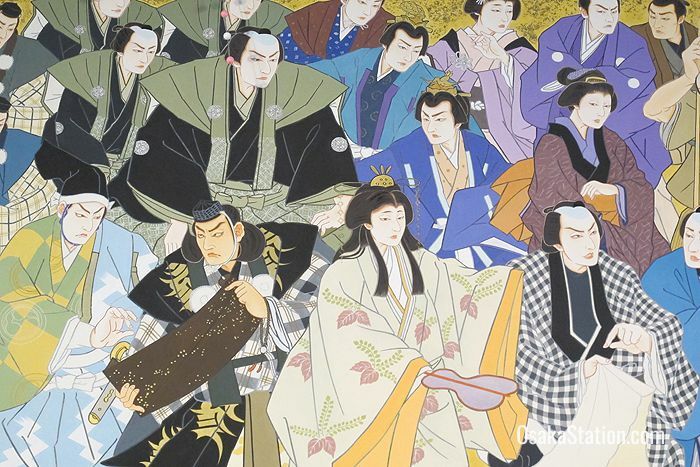 Kabuki is one of Japan’s great theatrical traditions which is known for its dramatic story-lines, stylized performances, elaborate costumes, gorgeous make-up, and fabulous settings. Everything is over-the-top and exaggerated in Kabuki and even if you can’t understand the language you can still enjoy the spectacle and the special effects too. Watching a Kabuki play the sense of excitement is infectious and often audience members will shout out the names of actors to voice their approval of their acting. This is not rude. It is an accepted part of Kabuki enjoyment. You need to be a real Kabuki fan to know when to do this however, so it is probably best not to shout out yourself! 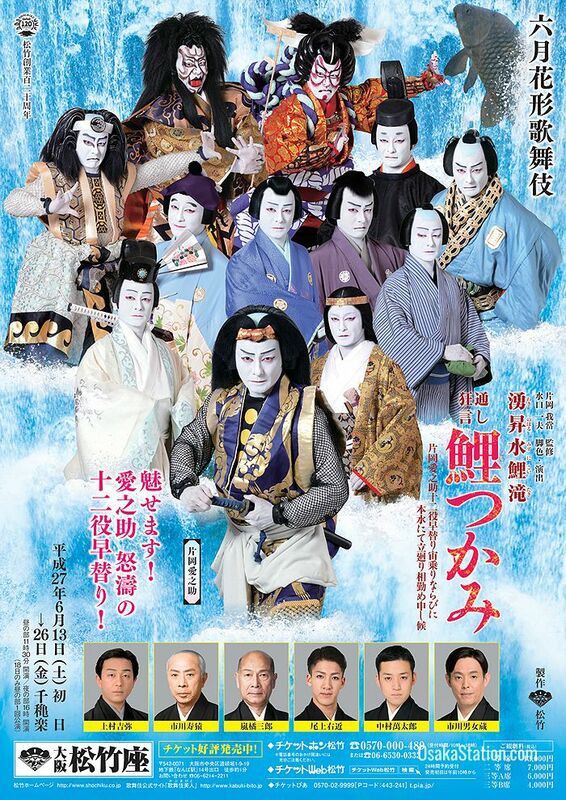 Another unique aspect of Kabuki is that all the roles are played by men. The actors who specialize in female parts are called “onnagata” and they are said to be so good at playing female roles that they are more feminine than real women! Kabuki actors speak an old-fashioned form of Japanese and in a very stylized way, so even for Japanese people it can be difficult to understand. The best way to prepare yourself for a Kabuki performance is to read an outline of the story in advance. That way you will have some idea of what is happening so you can sit back and enjoy the color and extravagance of the show. You can find some summaries of Kabuki plays on these three sites: Kabuki21.com, the Kabuki Plays Guide, and Jeff Blair’s Kabuki Page. Although many theaters supply headsets with English guidance, Osaka Shochikuza unfortunately does not have this service. If your Japanese is good enough, you can get headsets with Japanese guidance however. There are also English brochures and programs available at the ticket office that will give you some explanation of the show’s content. Another good idea is to bring a Japanese friend who can help to explain the show to you. Seats can vary between 4,000 and 13,000 yen depending on the position of the seats. Generally, the further away from the stage you are, the cheaper your seat will be. There are some Japanese restaurants in the basement of the theater building and you can make a reservation at these restaurants or order a bento style lunch box for the intermission at the front of the theater before a show starts. Upcoming performances are shown on the official Shochiku Kabuki website and you can order tickets from the Ticket Web Shochiku site. Osaka Shochikuza is located in the heart of the Dotonbori entertainment district. It is just 2 minutes’ walk from Namba Subway Station and 5 minutes from Osaka-Namba Station (for the Hanshin and Kintetsu Railways). Here is a map of the location.